Terex has issued another warning regarding counterfeit Terex/Demag crawler cranes, this time originating from South Korea. Similar to reports in 2013 (see: Counterfeit Terex Demag warning) counterfeit models are being assembled, branded and sold as used Terex cranes, either painted in a Terex white or a Demag red. 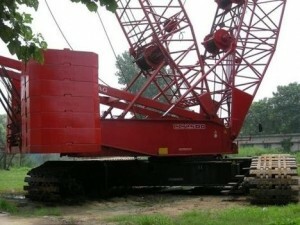 To date, the company’s CC 2500-1 lattice boom crawler crane seems to be the crane most commonly forged. While they are made to look like Terex cranes they are typically assembled from a blend of older and newer technology and a mix and match of components not designed to work together. These counterfeit cranes can usually be spotted by poor weld quality, inferior steel structures and improperly fitted tracks. Additionally, many of the standard safety components are missing.